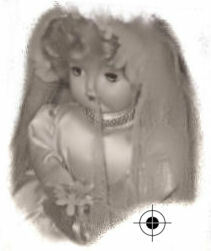 Reference comments in Pet Show 6 below: Here is a picture of the bride doll I promised. ...I’m hoping you took the blue ribbon. You are amazing with these pictures. Yes, you definitely picked out/enlarged the right doll. Next to just being able to "step into the picture" and look for myself, this is like making it come alive. As for the ribbons........I just remember that "she always won ribbons", and I would be SO proud, carrying her out at the end of the day. Does anyone know how many years these shows continued? Or when/why they stopped? Re-mark-a-ble! Mystery Blogger, you are something!! Mary Eda, I plan to speak to John Milliken, nephew of Miss Ollie, and find out just the kind of information you have asked for. He is the best person I am aware of to be able to supply that kind of thing...and he may not know, either. I am not in Monroe at the moment, so it will have to wait until next week. By the way, congratulations!! You certainly did take care of your dolls! Do you still have her?